We live breath, eat, sleep and of course drive Abarths everyday which we believe makes us one of the best places to buy an new or used Abarth. Right from our MD, David Hall through to our valeters the passion for this special brand is second to none. Our Abarth team led by Sales Manager, Alec Pun have been with the brand since it was first re-introduced to the UK in 2007. They have an enviable knowledge of all things Abarth but have also built up a great reputation within the Abarth Community. Alec and his team are on hand to guide you through the exciting Abarth range and arrange test drives for you. Fortunately we are located near to some fantasitic roads, perfect for gaining a real understanding of the excitiment of driving an Abarth. Our passion for the brand doesn't stop when we leave our premises either. We can regularly be found at Italian car shows in the East Midlands showing the latest Abarth products. As with the rest of the Rockingham Cars business we pride ourselves on being "Good people to do business with." The Abarth team are experienced, knowledgable and most of all friendly and welcoming. Abarth is exciting and we aim to make your experience of buying an Abarth as exciting and enjoyable as the car itself. "Further to collecting my new car I wanted to write to you personally to commend you and your team for a seamless and thoroughly enjoyable experience. In particular I'd like to convey to you personally the high level of service that I received from Alec throughout the whole experience, through from initial contact in response to my online enquiry all the way through to collection. Both my partner and I (who also purchased a Mazda at the same time with Ross's kind assistance) visited numerous dealerships over the period of a month, to which were perfectly pleasant; yet we never encountered the level of attention and service that we did at Rockingham Cars. Personally I can't thank Alec enough, he went out of his way on numerous occasions with regards to my different queries, albeit regarding the car itself, test drive or looking at differing finance options for me. It was a real pleasure to deal with Alec who you can tell has a real passion about what he does, I never felt pressured or uncertain at any time and Alec always responded to my queries/calls more than quickly." "Even though we live here in Aberystwyth both my partner and I feel very strongly that we'd like to continue the relationship with Rockingham Cars (Alec and Ross) with regards to servicing etc and even future sales hopefully. Thank you all once again for a thoroughly enjoyable experience, we're both enjoying our cars!" "Just a quick email to say Thank You! Having picked up my 500 Abarth last weekend I haven't stopped smiling yet. I just wanted to say the service I have received from Jon and the staff at Rockingham Cars has been nothing short of fantastic! From the first email contact to the most comprehensive and pleasurable test drive I have ever had and finally the pick up, wow! was I happy. Simply the best service I have ever recieved from a car dealer, thank you. Wishing Alec and the rest of the team the very best." "I think one word sums up my Abarth 500 purchasing experience with Rockingham Cars - Smooth. Jon was great, took his time to explain everything clearly and obviously has great enthusiasm for the brand. Alec deserves mention too for his friendly welcomes!" 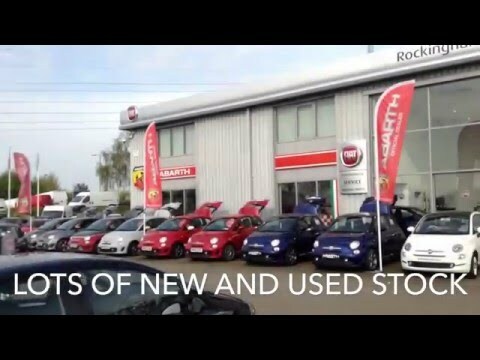 "Luigi (my Abarth 500 Esseesse) is the fifth car I've purchased from Rockingham Cars over the years. Jon was great and sorted out everything quickly as efficiently. I'm just waiting for the crate now with all the extra bits and pieces to turn up!" "Picked up my Abarth Punto SuperSport last night - fantastic service. Alec was a joy to deal with. A breath of fresh air to to deal with an enthusiast, he was as excited as me. Many thx for everything. Cheers G"
"I would like to say a big thank you to Alec at Rockingham for making my new car buying experience an absolute pleasure! The whole process was made so easy and nothing seemed like to much trouble for them." "As I was downsizing from a larger car, Alec let me test drive both the 595 and the Punto on my 1st visit, and didn't pressurize me into buying on the spot." "I have been to other garages (different manufacturers), where you feel like you have to buy there and then and that they are doing you the favour. This was definitely not the case here." "On my 2nd visit I took the plunge and ordered"
"Prior to delivery, Jon was in contact a number of times to let me know what was happening and that everything was on track. And on one phonecall, I couldn't believe that I was even given a choice of registration for my plate instead of them just allocating it one from their list "
"To top the experience off I received a letter last week thanking me for chosing to buy a new Abarth from them. It really did put the icing on the cake, and made me very pleased I decided to go to them for my purchase." "So a big thank you, and here's to many happy miles of motoring"